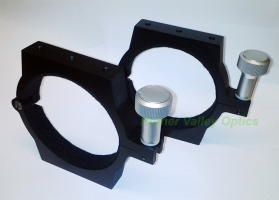 These 90 mm, felt-lined mounting rings are made out of solid aluminum, anodized in black or silver, and will fit most 90 mm OD tubes, and all William Optics 80 and 90mm telescopes (Megrez 80 and 90, ZenithStar 80, GT81). 80mm diameter tube cradle to suit the Takahashi FS-60CB series of telescopes. 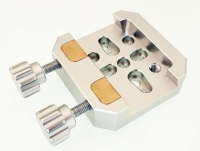 80mm tube cradle to suit the Takahashi FC-76DC and FS-60Q series of telescopes. 95mm diameter tube cradle to suit the Takahashi FS-78, Sky-90 & FSQ-85EDX series telescopes. The 125mm PLUS support rings can be used with telescopes of various brands (such as 120-130mm diameter refractors) with 125mm in diameter optical tube.